Nothing is more primal than firing with wood. The ash and flame embrace the form and can carry it into mythic time. I approach my work with intensity. I'm not trying to moralize or instruct in my forms, but to simply delight, surprise, bring humor or quietness to someone sharing my work. 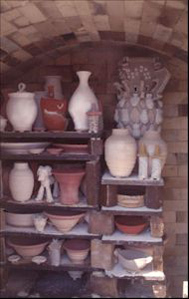 The kiln's stacking capacity is about 35 cubic feet. 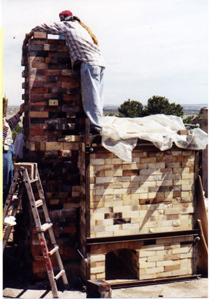 In 1993, I had built a smaller soft brick version of the kiln as my MFA thesis research. As expected, the kiln is economical and efficient to fire. In researching the project, Paul Soldner and Phil Cornelius wrote to me agreeing with Fred Olsen's assertion that an efficiently designed small scaled fast firing kiln fires from "dead cold to cone 11 in less than 4 hours." 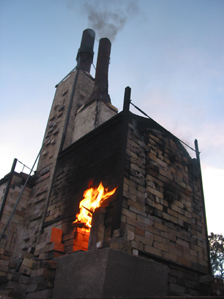 As Soldner said, fast firing wood kilns are "so fast, so clean and so lean, they don't leave any aesthetic qualities...because of short firing cycle and very little ash build up." My thinking was that if I could fire it fast then by adjusting the fuel and air, I could fire it slowly. By raking the coals frequently, a good amount of ash is deposited on the wares and heavily fluxed wood ash glazes are achieved. The results of the kiln encouraged me to build the larger hard-brick version. 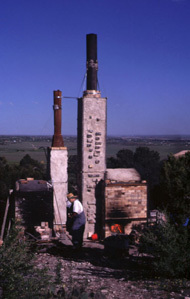 In Spring 1998, a group of ten students joined me in building a hard brick fast fire wood burning kiln, based on Fred Olsen's design. I am beginning to understand its potential.